Did you happen to take a look at 9news.com today? 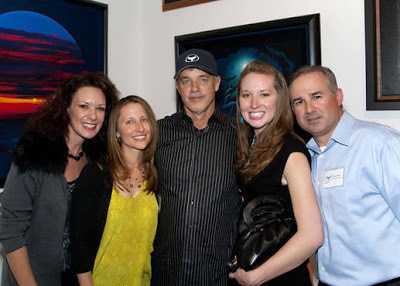 If you did, you might have seen The Stasko Agency‘s Lu Stasko and Shelby Arnold kissing the cheek of renowned marine wildlife artist Wyland. 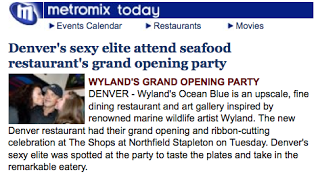 The Stasko Agency worked alongside PR colleague Tina Menditto to promote the Grand Opening of Wyland’s newest restaurant, Wyland’s Ocean Blue, at The Shops at Northfield Stapleton. Wyland himself was present at the VIP reception last night, which drew over 250 artists, media, fans and locals. Even the LinkedIn Rockstar, Mike O’Neil, was there to partake in the excitement. An upscale, fine dining restaurant and art gallery combined into one, Wyland’s Ocean Blue features sustainably caught seafood, farm-to-table meats, and coastal Pacific flavors with local and seasonal influences. A portion of the proceeds from each meal will go toward the Wyland Foundation and the Think Blue Foundation, both of which support conservation of the Earth’s precious waterways. 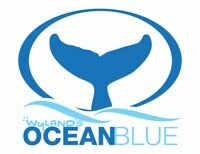 Learn more about Wyland’s conservation and advocacy efforts at www.wyland.com. Make sure to check out Metromix’s online photo album for a complete look at last night’s event. Holiday Shout Out: The Bookery Nook Happy Thanksgiving from The Stasko Agency!